While previewing Excel files from Outlook 2016, if you get "This file cannot be previewed because there is no previewer installed for it", try this fix. Microsoft recently released Office 2016 to end users. If you can’t make clean install of Office 2016, then see this fix. Well, if you’re on Click-to-Run based installation of Office 2013, you can directly upgrade your installation to Office 2016 by checking for new updates. However, as usual, users who’re are upgrading have some issues thereafter update is done. There is a known issue which has been reported by many users and it’s related to previewing one Office application file in another application. 2. 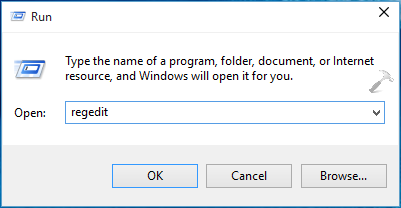 In the left pane of Registry Editor, navigate to following registry keys based upon the way you’ve installed Office. 4. Once you corrected and verified all the registry strings mentioned in previous step, close Registry Editor and reboot. After restarting the machine, problem would be resolved. Hope this helps! Go here to review new features of Office 2016. I tried this fix, I verified that all Registry String values matched what you have there and my previewers still do not work for any office poduct. The Outlook pdf previewer works just fine. Only Microsoft office files will not preview. I’m running Office 365 Current version on a company subscription. We have over 30 licenses on our account. I ‘m the admin for this account. I did mislead you on the previous post as Excel does not preview but Word & Visio documents do. I have not tried Power Point or any other Microsoft files as I rarely view them. Thanks my string was not there I added it and it worked…Thanks alot. Good day. I verified all the strings as you advised, regrettably, the problem persists. I have Office 2016 Home & Business and Win 10. Neither of them are upgrades. all settings are correct but not working windows 7 outlook 2013. Do you have other solution for this issue? ^^ Try the steps mentioned here, write back if issue persists. All settings are correct but I still can not preview Excel and Word files. I’m working on windows 7 and outlook 2013. Do you have any other solution for this issue?